The Great Connections week-long seminars bring young adults together to discuss the great works and ideas of civilization. Using a unique shared inquiry methodology, participants discover remarkable connections between the ideas they read about and discuss, and the contemporary world that they inhabit. It is in this process they commonly grasp a deeper sense of autonomy and personal power. Cognitive: Their ability to reason about any subject increases remarkably; no longer are the poetically-inclined daunted by physics, or the chemist by poetry. Studies of students using this methodology found cognitive skill increases on the Watson-Glaser Critical Thinking Appraisal anywhere from 20% to 85%, depending on their educational and cultural background. This test parallels performance on IQ and college entrance tests such as the SAT and ACT. Knowledge and understanding: Most of the works our students read are from the classics or Great Books, which have shaped civilization. Not only does student knowledge of the great ideas and their history radically increase, but so does their interest in them as they learn that these ideas are all around them and have been influencing them without their knowledge! Their social skills, especially in productively collaborating with other people, blossom as they learn how to effectively converse about difficult and controversial subjects. Our students have civil conversations on topics such as the existence of God, in which they plumb the depths of each other’s thinking. Through the conversations, they learn many different ways to approach and reason about difficult material—great skills for their careers and personal life. Meaningful friendships: Moreover, these deep and respectful conversations engender tremendous trust in each other. After discussion sessions they have intense personal conversations and connect profundly on levels usually difficult to achieve over years, no less a few weeks. Self-confidence: Most importantly, they develop a strong self-confidence in their own judgment. No longer dependent on the opinions of authorities, they know how to use reason and evidence to come to their own conclusions. They trust themselves. “As soon as you trust yourself, you will know how to live," Goethe wrote. A free society is a marketplace of ideas in which each person is treated as an autonomous individual. The way in which the exchange of ideas and values proceeds. Many students have spent years in classrooms that create a social order dominated by an Authority-Teacher. Students are expected to be Followers who receive the wisdom of the authority and repeat it back in class, on tests, in papers and projects. Does this reflect the characteristics of a free society? We say "No". Unfortunately it is often the only learning environment students have known, in high school and college. Our seminar facilitators use their expertise to craft the entire learning environment: physical, cognitive, psychological, and social, with every element selected and integrated to empower the student’s autonomy. Seminar participants come to appreciate each other as mutual traders in learning. This results in a psychologically safe and cooperative environment that encourages exploration and creativity. Ultimately, the seminar functions as a market of ideas, skills, and values where reason, combined with the invisible hand of individual self-interest, results in greater knowledge, reasoning, and social skills for all. Students become confident that they can understand anything first-hand—without an authority interpreting it for them, and without conforming to the opinions of others. This deep self-confidence is foundational to a flourishing life. During the Great Connections Seminar, a unique society that reflects life in full freedom emerges within this specially crafted learning environment. The values and virtues developed in each person at the seminar help to create the experience of a free, voluntary, and cooperative society. It foreshadows what is possible in a freer future, while giving students the opportunity to practice the art of living free. This is why our students find themselves liberated and transformed. All learning at the Great Connections is in collaborative discussions with the teacher as a guide to the material, not the authority with the answers. 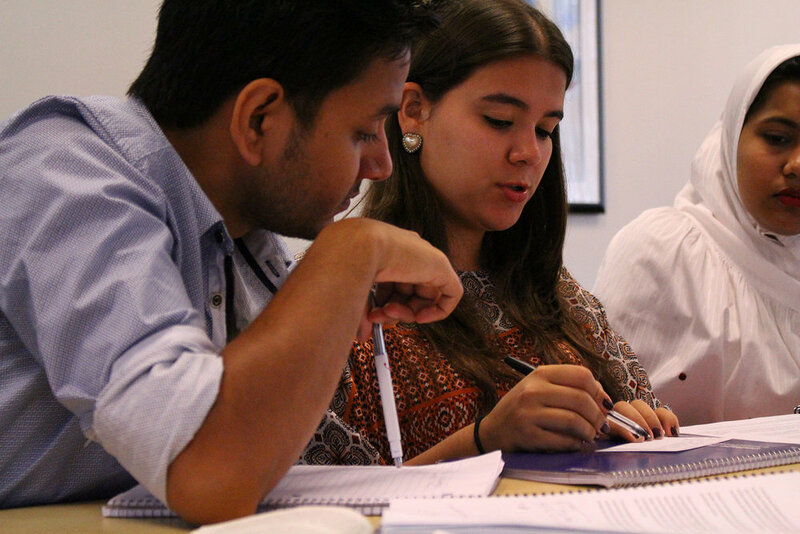 Using our unique shared-inquiry methodology, instructors help students examine, analyze, and discuss the material first-hand using an evidence-based process. The students synthesize the information themselves, rather than have the information and answers handed to them. Students learn a great deal from hearing how other students reason about the same material. Our students study logic, science, literature, art, mathematics, architecture, economics, politics, and history. We enable them to be sure-footed in whatever ideas and domains of knowledge they encounter, no matter what profession they enter. Ultimately, reason is the only authority, meaning that the best reasoning along with the best evidence have the final say. Our program is a specially crafted form of the guided collaborative discussion method developed in the early part of the 20th century to teach The Great Books. Robert Maynard Hutchins, president of the University of Chicago, assembled a committee of brilliant thinkers and educators, including John Erskine, Mortimer Adler, Mark Van Doren, Richard McKeon, Scott Buchanan, and Stringfellow Barr to devise this program. In the late 1920s, they were worried about the emphasis on narrow specialization in American colleges which fail to educate in great ideas and reasoning, and in the products of Western civilization and thought. They knew that an education in the liberal arts, with an emphasis on cross-disciplinary, integrated, and moral learning was essential to developing the free human being and the foundation for real professional and personal success. Our advisor, Michael Strong, who explains the method and its academically and personally superior outcomes in his book The Habit of Thought. What happens at a Great Connections Seminar? At a Great Connections Seminar, we discuss great writing and ideas in groups of 15 or less. The readings are linked together by a theme such as “Reason and Love” or “Reason and Power.” We read texts from philosophy to physics, spanning the ages and the ideological spectrum, from Plato and Aristotle to Ludwig Von Mises and Tom Wolfe. Students receive detailed instructions before the Seminar including materials to read in advance. Ortega y Gasset, “The Role of Choice in Love,” Machiavelli’s Discourses on Livy, and Newton’s Principia on the laws of force are examples of texts we use. We have a set of special discussion principles that participants agree to abide by. During the Great Connections we explore art, architecture, music, and personal psychology and introspection to expand participants’ awareness of their own inner life. In conjunction with this, we visit art museums, historical sites, famous buildings, and concerts. These outings are guided by experts, such as famed architect John Gillis. We also engage in improv comedy workshops as a way to enable participants to get to know each other in a relaxed and fun manner. This improves their intellectual discussions and collaboration. Improv also hones skills of collaboration and mutual investigation. 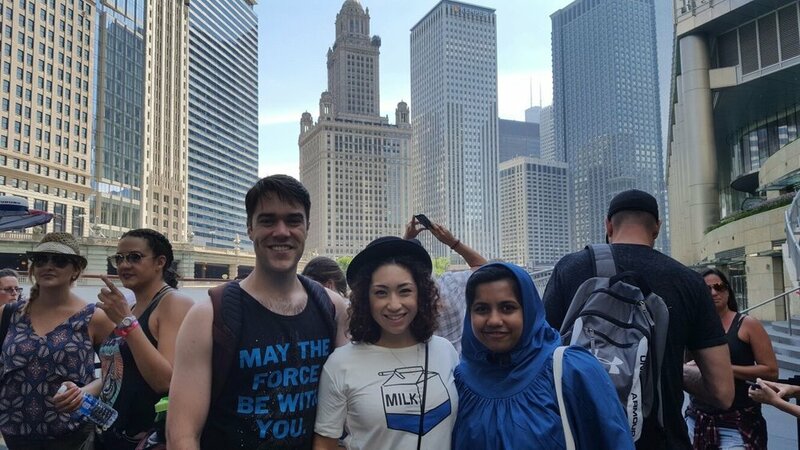 The week-long Great Connections is most often held in Chicago, with students residing at local college dorms where classes are held in conference rooms. Read more about our accommodations here. Explore the daily schedule of one of our seminars.